HE golf bug has bitten me again. I am in the midst of making a set of circa 1870 golf clubs. Having a hand tool background for furniture making has been helpful for understanding general important concepts such as grain direction that are applicable to making golf clubs. On the other hand, I needed to learn several new techniques and work with some unfamiliar components (molten metal, ram's horn...). This post is part of a few to follow describing hand tool techniques of 19th century golf clubmaking. The first obstacle was trying to create a golf shaft. Ash was the traditional wood for the shaft up until about the 1820's. Ash, being a local wood in Scotland, could be worked readily while still green. 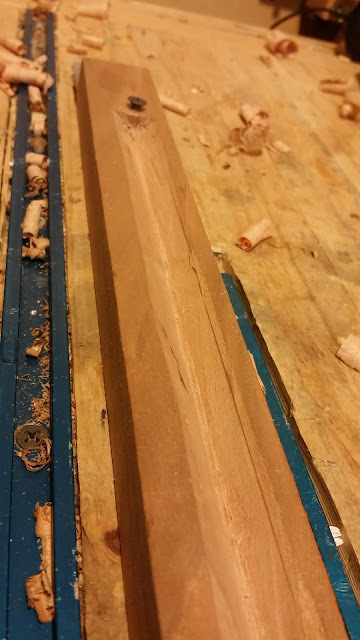 Thus, it was riven (split) to form straight grained billets, then worked down with a spokeshave. Other woods known to have been used for shafts included lancewood, greenheart, lemonwood, hazel and elm. By 1828, we have evidence that hickory was being used for golf club shafts. Once the springiness and strength of hickory was discovered by the Scottish clubmakers, the other wood species took a back seat. Being imported from the USA, the wood was not as easily worked using green woodworking techniques, although the earlier shafts were still riven. Drawknives would have been tougher to use, so traditional cabinetmaking/joiner tools, such as hand planes, were used to shape the shafts. A stail engine, which turned out to be my favored method. Lathe. I am tempted to think that this may be the best method, but I have had no luck in finding somebody with a 44" capacity lathe. A steady rest seems mandatory. Purchase a hickory shaft online. Green wood is easier to work. Watch the grain. 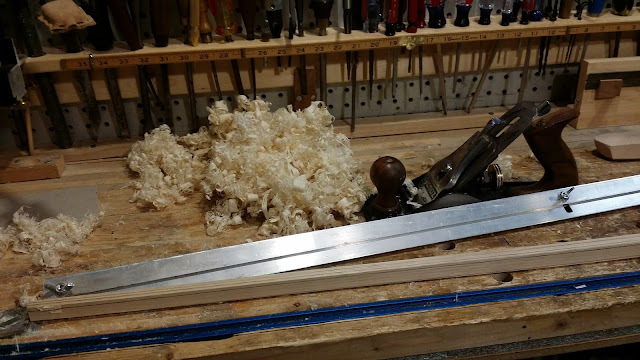 Start with a drawknife to take down the corners and finish with the spokeshave, Set the shaft aside to dry, then you can use a card scraper, then sandpaper. 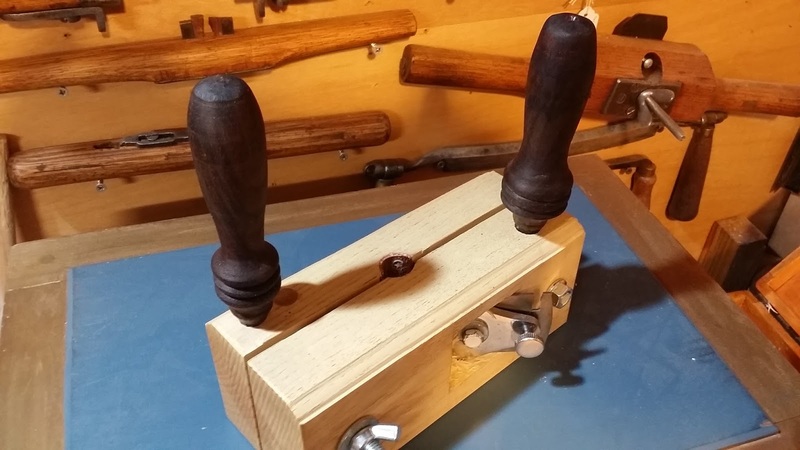 Depending on the grain, you may need to push the spokeshave or pull it. If the "flame" point of the grain points toward you, use a pulling motion. 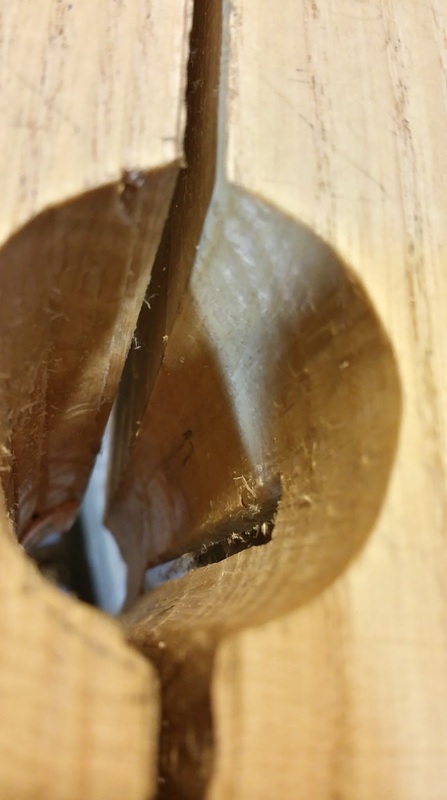 A major drawback of the drawknife is inconsistency and tear out. 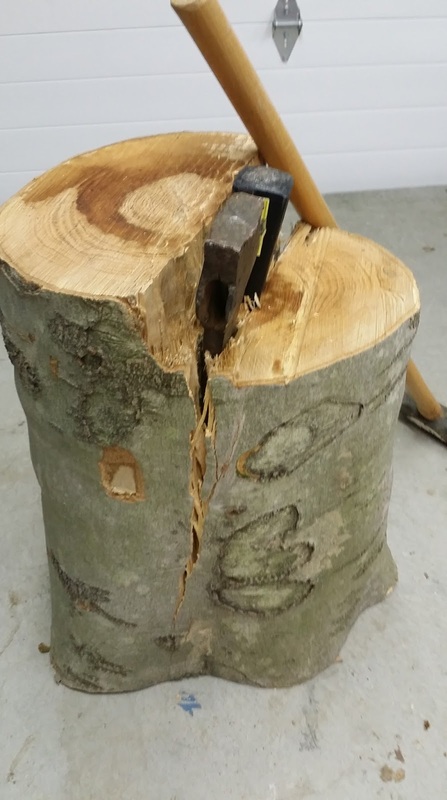 Those who make Windsor chairs may favor this method, but they typically use green wood. 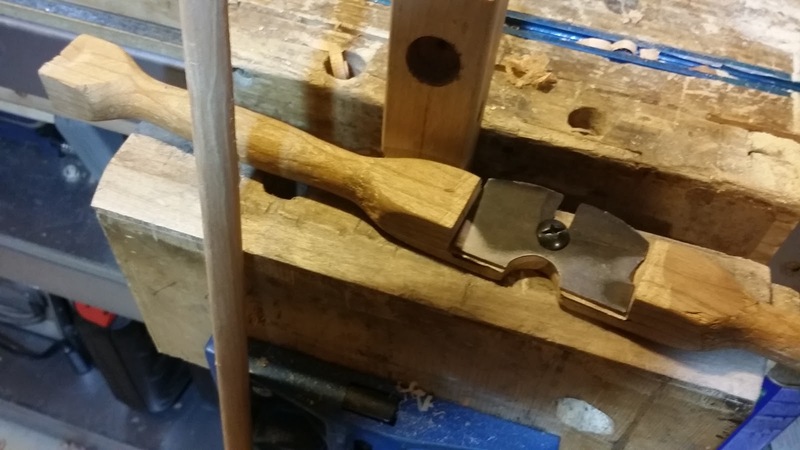 One can also use the shaving horse and spokeshaves as an ancillary method after creating a 3/4" dowel. 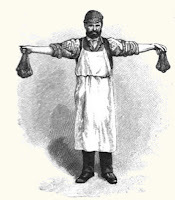 Using a handplane was the favored shaft tapering method by the last half of the 19th Century. Five-time Open Championship winner and clubmaker, J.H. Taylor, (likely with his colleague, Mr. Cann) wrote a 15 page detailed treatise on golf clubmaking, in The Book of Golf and Golfers (1899), but divulged only two sentences on the art of making a clubshaft. Notwithstanding that this is the best reference I have found to date describing the technique of clubmaking, my guess is that Mr. Taylor purchased his shafts. Planing the edges of the shaft into an octagon. The aluminum bars, affixed together with bolts and wing nuts through three slots, are used to mark the taper lines. 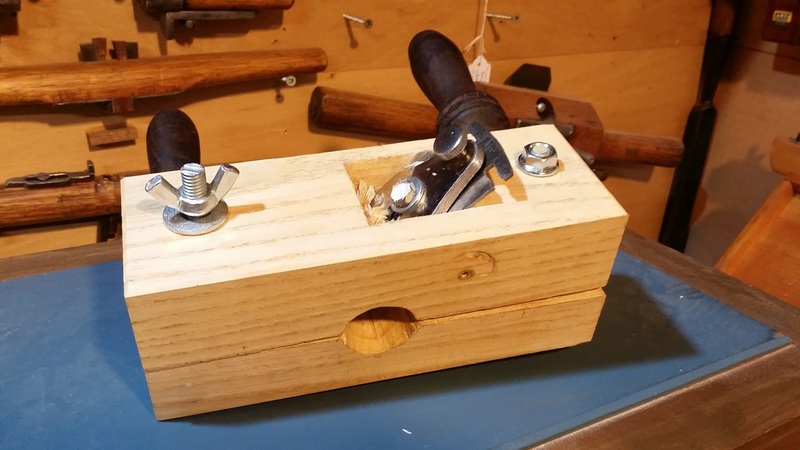 If you have a combination plane, you can load your cutter No. 29, the 3/4" bead, and plane away. Hickory is a difficult wood to work with a molding plane. The going gets tough the deeper you get and you will get a good workout. 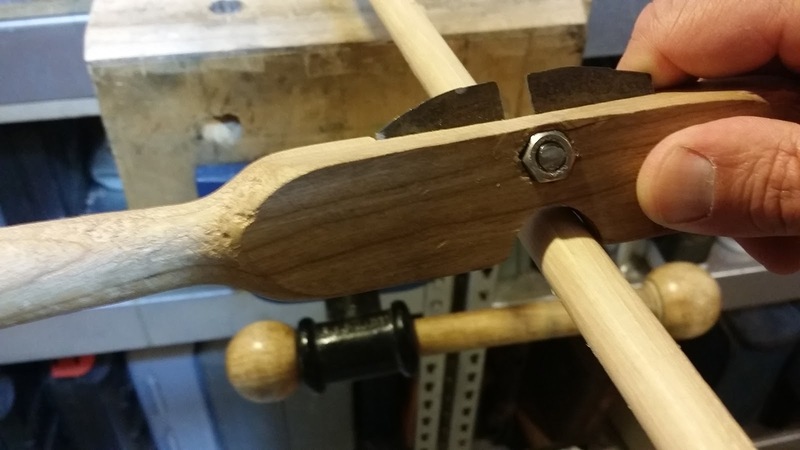 The result will be a 3/4" dowel which can be tapered with a stail engine (below) or a spokeshave or handplanes. stock so that both fences can be used without bottoming out. The inside is tapered to accommodate stock about 7/8" square. This contraption works like a giant pencil sharpener. The stock used is a riven, then band sawn, 7/8" square piece of hickory. I am sure the result would be a lot smoother. 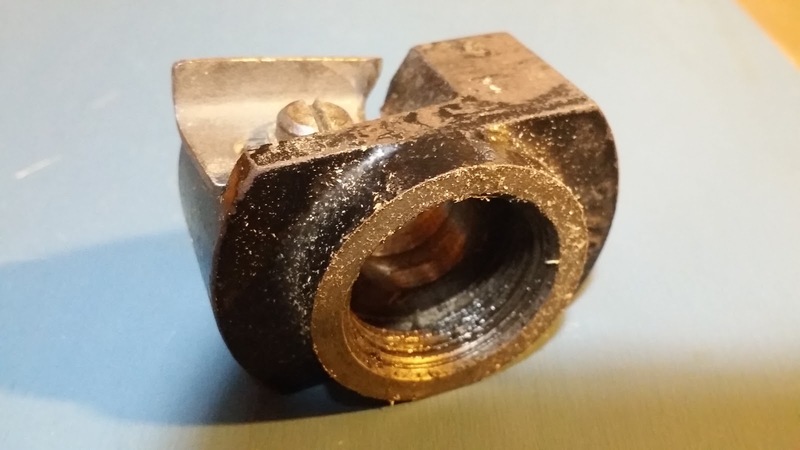 As the wing nuts are tightened gradually, the dowel diameter lessens. This particular stail engine can make dowels form 3/4" to 1/2". Chamfer the corners of the stock first. This is another variation of the giant pencil sharpener method. 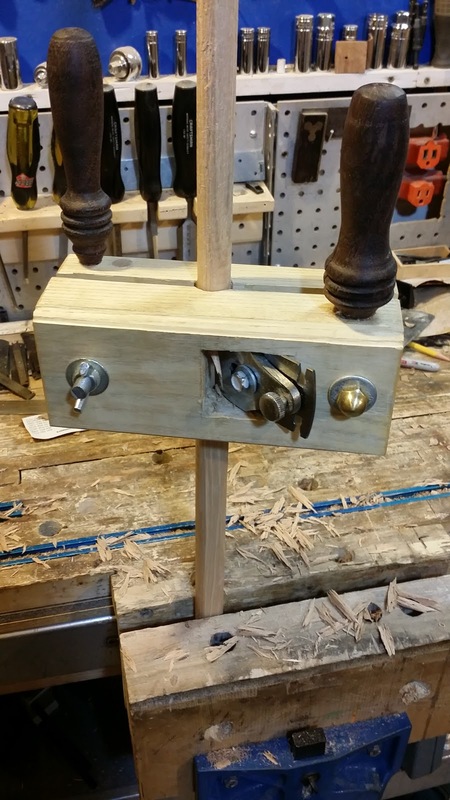 Feed in a square piece of stock, crank the handle and out comes a dowel. Various diameter adapters are available. I thought I remembered playing with the Stanley 77 as a kid. A card scraper cleans up the faceted edges. A tool called a chair devil, which is just a wooden handled tool holding a card scraper with a 3/4" semi-circle, works well to remove thin shavings. Putter with hickory shaft and beech head. The beech wood for the clubhead came from a tree that was felled on the golf course adjacent to the 18th tee near my house. We used a two man cross-cut saw to cut the tall massive stump into sections, hauled the logs with a wheel barrow, then split that log with wedges. Once the log splits were manageable, milling was completed with a band saw. The wood was air dried for over two years. Hello. I thought I'd add some comments. I've been collecting antique golf clubs since 1995 ...and in about 2005 I made my first long nose club. I did put some images on line and after a while Kelly Leonard called me up and we had a great chat. I then changed a few of my websites and inadvertently lost the page that documented my first attempt at club making. But today going back through some old discs I found the pics again...and I've reposted them on my website www.antiquegolfclub.co.uk I've probably made about 20 clubs in my time and each time I think I've improved little. I'll be putting some images of a replica Troon club on my website soon. When I first started making Troon replicas I just did it from images in The Clubmakers Art..then I got the dimensions from Bob Gowland's book...so I challenged myself to make one as exact as possible and I'm pleased to say it's turned out well. I also make replica featheries and will try a few replica gutta balls soon hopefully...but like Chris McIntyre I'm planning on using synthetic gutta as I've not been able to find a source for large quantities of real gutta. 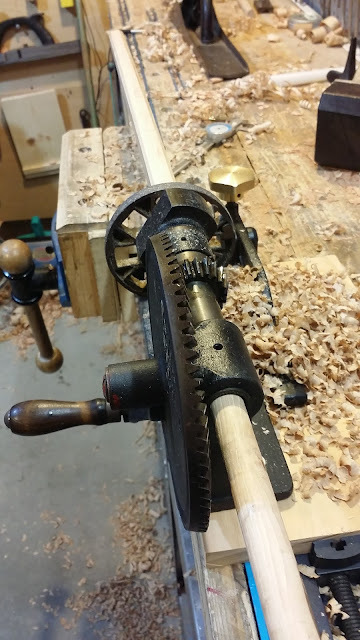 I smiled when I read above about making shafts on a lathe....I tried for about 2 years ...I think I got up to 4 steady's on the bed....they never came out good...the best method by far I think is the "archers rest" and a small hand plane...quick and no dust, just nice curly shavings. Thanks for posting your stuff fellas..an enjoyable read. Regards Gavin Bottrell, Warwickshire, UK. Thanks for the info. I wasn't even aware of Bob Gowland's book, but I read about it on his website and went ahead and ordered a copy of his book. Looking forward to learning new information about club making and its history. I'm not familiar with an archer's rest. I use a cradle initially and then switch to a shaving horse. Would you be able to elaborate on an archer's rest? Hi guys, thanks for a very interesting article. I have been Clubmaking for 43 years and making "Long Nose Clubs for about 20. 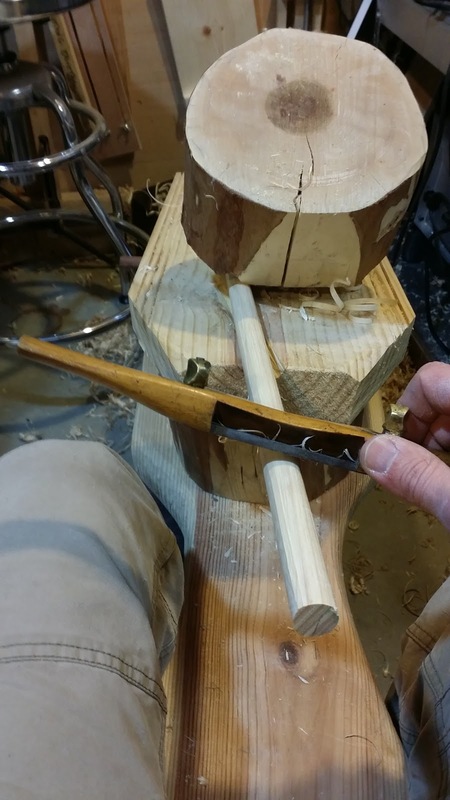 I came onto the "V" Shaped "Wooden Rest" for "Supporting" the shaft whilst "Planing" pretty early in my Wooden Shaft Making Years, and have used it ever since. I recall to articles that brought the "Use of the Hand Plane" to my attention. One showed a photo of Laurie Auchterlonie planing a shaft with a "Hand Plane" with the shaft sitting in a "Wooden Rest". The other was a description of the Great Clubmaker Jack White (Whilst at Sunningdale) "Not giving his Apprentices the "Glass Paper" (to finish the shaft) until he could count "32 Sides!" Planed on a Shaft! And then describes "4 Corners of the Billet, Planed to 8" "8 corners planed to 16" and "16 planed to 32!" 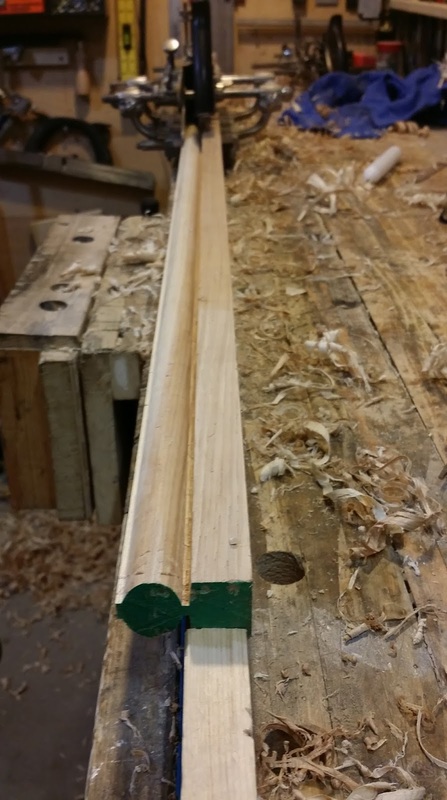 You have no idea how long I tried to get 32 sides on a "Planed Shaft!" Before realising that 16 Sides is about the "Most Achievable!" And then the sides are that close together and the "Shaft is So Round" that a thin lead pencil line on every facet, had the lines "Against Each Other". Interestingly I later learned that exactly the same method (Albeit a much Larger Scale) is employed by Shipwrights to "Plane a Mast!" 4 to 8, 8 to 16 etc, with an Old Shipwright telling me his boss "Expected Them" to get "32 Sides" on a 12" Diameter Mast! So what hope would you have on a 3/4" diameter Shaft! The reasons I "Prefer and Still Use" the "Wooden Rest and Plane" are.. 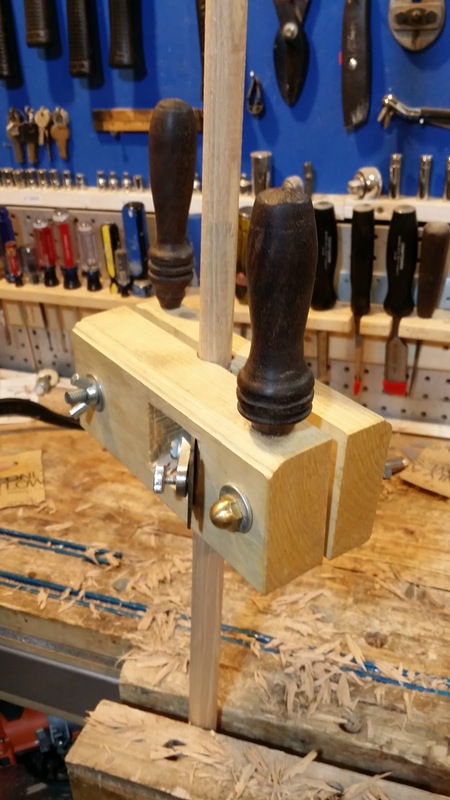 The Wooden Rest, with a "Moveable" wooden dowel as a "Stop" at the end, allows you to "Plane" and "Turn the Shaft" by hand, freely all the time. The rest also gives you a "Check" of "Straightness" and "Roundness" all the time. 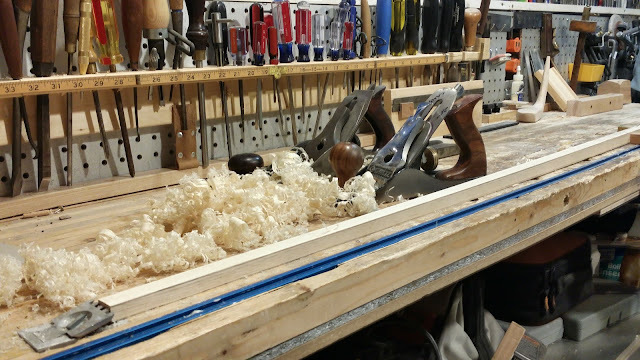 But I often stop and check Straightness and Uniformity by Eye..Using a "Hand Plane" ensures the Shavings and "How Much Wood you Remove" with each stroke is "Uniform". You can use a "Long" Leveling Plane, to get very good Results, especially with the "Initial Taking Down". There is no "Doubt" in my mind, that a modern lathe, especially if it is CNC (Computer Operated) does a marvellous job! But for me, the "Keeping Sacred" of the "Traditional Methods" and "Using No Modern Tools At All!" is what is most important to me. I meant to say, after Planing, by using various sizes of planes, "Lighter and Smaller" for finishing work. I then sit the shaft in a Groove across the "Rest" and holding and turning the shaft with one hand I "File with a Big Coarse File" in continuous strokes as far as I can reach, from one end of the shaft to the other. The file Sits at about 45 degrees to the shaft during these strokes. "The longer the Strokes" The more "even" is your work! By the way, if I get a shaft "Round and Tapered" 3/4" to 3/8" for woods and 3/4" to Cone for irons, from a 1" square billet, in 2 hours, I consider it a job well done. Would love to Catch Up and Share Ideas with anyone interested.. Kind Regards Ross Baker Victoria AUSTRALIA. Looking for the correct name of a tool that can put grooves in persimmon wood club faces. I call it a "Two Handle Head Graver Rasp". Correct name unknown. I saw the link and photos. I don't know the exact name of the clubface scoring or grooving tool. Chris McIntyre's Auld Golfer website has a video of one that looks quite different. There must have been different methods of producing score lines. The long nose clubs occasionally had fine score marks often running diagonally across the face. Were these made with a marking knife, scratch stock, rasp or file? The score marks or grooves after 1920, I would guess, were machine made for the most part. Unfortunately, I have not yet "advanced" to this era to know much about this grooving tool. If you are not looking for the tool as a collector and just want something to make grooves, you can make your own tool quite easily using a scratch stock. 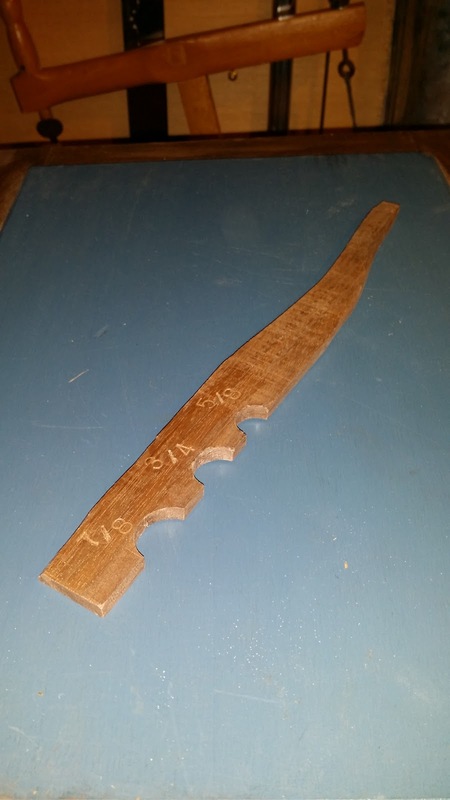 Below is a link of one that I made using a piece of a hand saw in the scratch stock. You could use a file to create your own custom spacing and depth using a piece of an old saw. For wider spacing, use fewer teeth per inch. A small file could be used to flatten the gullets of the saw. I am probably missing something, but I don't quite understand how the tool shown on the Auld Golfer or in your photo is used with any accuracy since there is no fence. Would you use your finger as a guide? Ross, 2 hours is spot on! For me it can be a little quicker if the hickory is cooperative. 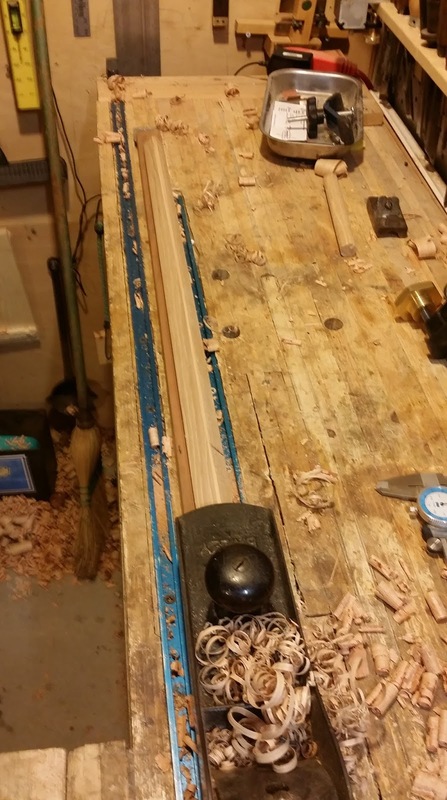 Fewer spokeshave direction changes. When you have a section where you need to use the push and pull stroke you have to be aware of that fine line where the two directions meet. A pull instead of a push can cause quite a tear. Hopefully in on a section that much more material needs to be removed and not near the tip. After you've done a couple hundred you learn to read the wood but the wood gets ya every now and then. Elm, hope all is well with you. Are you still making clubs? Always enjoy visiting your site! I have been making mostly putters from beech I harvested a couple years ago from the golf course adjacent to my house. If you're willing to "advance" to the last couple of decades of the 19th century, you could shave off quite a bit of time using a trapping plane. Robert Forgan in 1897 described the use of spinning the shafts on a lathe and using a ring plane to taper them in a matter of a couple minutes.I hooked up a shaft billet to a battery operated drill and made a shaft with a trapping plane in a few minutes. Hi Elm, I've never heard of a trapping plane until I read your post. 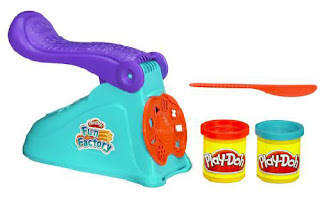 I've watched multiple videos with it in action, including the fishing rod video. It amazes me how creative people were back then. It would make shaft shaping much quicker for sure. It looks like it rely's on grip pressure to control the amount removed. Did you buy yours from the UK? All you need then is a drive source. I will keep my eyes open. Quickly before I head back out to the shop. I was making some 1860's long nose putters this winter. The majority of them were out of hard white maple. I decided to take a piece and make a hitting club. I built a 10* play club. I only had 8/4 stock so had to have minimal loft. I took it out a couple weeks ago to see how the face would hold up to the guttie. Not a mark on the face. I was shocked. Beech and hard white maple are pretty close in janka hardness so I didn't get my hopes up. I will try and find some 12/4 and possibly 16/4 maple which would mean you could build any club you wanted. I've also started building transitional clubs that are to played with a low compression ball. They are fun to build and even more fun to hit. This year I am only playing with my hickories. My 1800's set and my 1920's set. I build all my woods and have friends send me iron heads they won't be using. I make a shaft and put them into play. 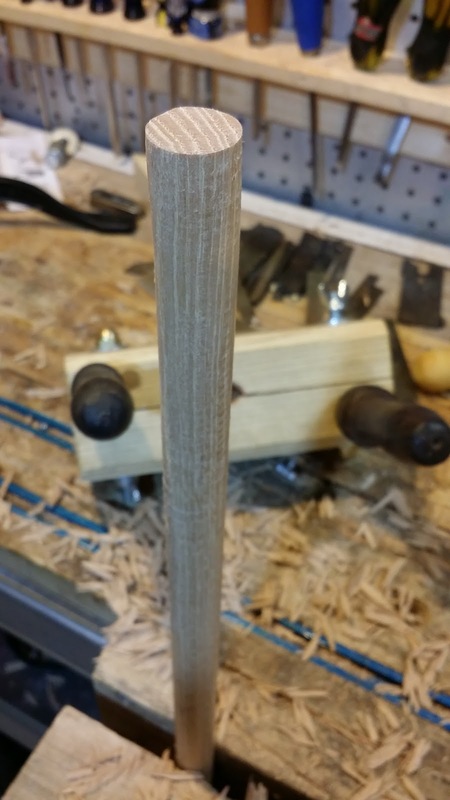 I use my veritas tapered tenon cutter to rough out the taper and with a little belt sanding and a whole lot of scraping eventually get them to fit. This got me thinking of a tool similar to the veritas that would cut the taper to basically fit in with only a little fine tuning. On mine you would have to angle the cutter so it removed more material as you go towards the shoulder. I don't think I have the adjustability to do that. You guys who are knowledgeable when it comes to the hand tools might know of something that is already out there. The trapping plane is from Ashem Crafts from the UK. 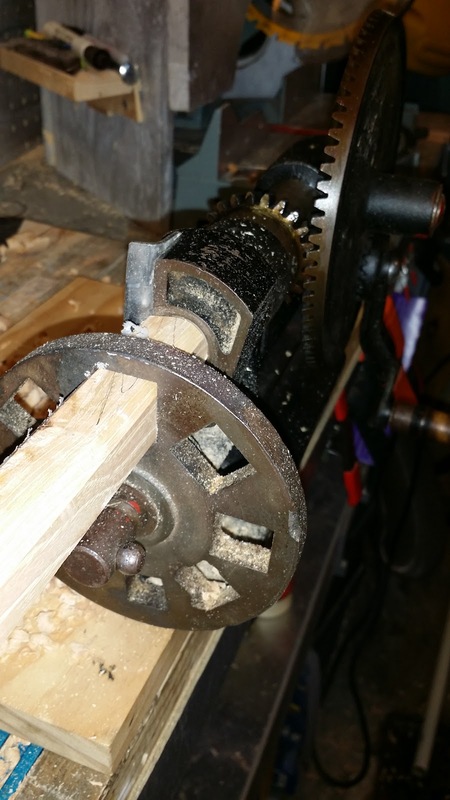 If you use a lathe as your drive source, you need to run it in reverse. I use an electric drill or the manual crank as shown in the post. I've wondered why maple wasn't used for the long nose clubs. Neither beech nor maple are native species of Scotland. I think the maple in England is the field maple, which is softer than ours in North America. I hope your game is going well with the hickories. I have fooled around with manufactured hickories, but I think the shafts are too whippy for my liking. I have only hit my own made play clubs a few times crossing my fingers that they don't explode with each hit. Elm, when all was said and done, assuming you ordered the trapping plane from the UK, what was the total cost? I really like the way it works. If you have access to hard white maple give it a try. It's not much harder to work than beech. I certainly know how you feel when hitting the clubs, not knowing if they will stay together. One day we'll have to talk. I've been through that and although it's something that you always have in the back of your head I don't have any worries now. I have learned things over the years through trial and error. Putting them all together makes me confident the club won't break. Knock on wood! Trapping plane cost from Ashem Crafts including shipping was $165. That's quite reasonable. I have a friend that is going to Kent to visit his family in June. He will bring one back for me, all I have to do is have it shipped to his parents house. The other task I see the trapping plane useful for is shaping the taper on iron shafts. Very short taper of roughly 2 1/4" but after watching the fishing rod video I'm sure it would work fine. Not sure if the trapping plane can make that abrupt of a taper for the tenon for the golf shaft. I'm not sure either. I would give it a try to find out. I would like to talk with you. I have a question that I'm sure you can help me with. You can email me your phone # to klhickory@gmail.com. Thanks. I would try to contact Tad Moore and ask him specifically what you are looking for. He makes modern and hickory clubs. He uses a back knife lathe to shape his shafts. Of course i would also recommend trying to make your own...something to do during those long winter months plus you can gain a new hobby and have a deeper sense of satisfaction when hitting your club.